Thornbury's 3 Ravens has never been averse to producing the occasional out there release. Yet it's probably fair to say that, in recent times, the character of its current head brewer has been shining through increasingly in its beers. Brendan Sullivan is a fermentation fanatic (not just in the beer sense) who, prior to becoming a commercial brewer, was winning amateur trophies for Berliner Weisse long before they were really "a thing" in Australia. 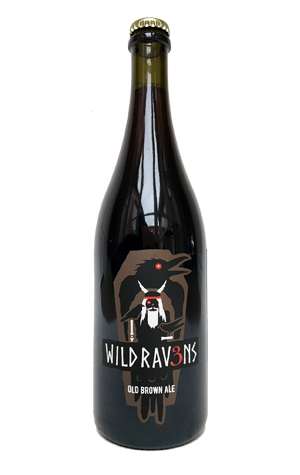 The latest project of his to leave the brewery is entitled Wild Ravens and is one that's been bubbling away for more than a year. The Old Brown is the first of an initial trio of beers to be released under the Wild Ravens banner, all of which take as their starting point a base beer brewed at the start of Winter last year. It also features an amount of Bittersweet End, the imperial IPA brewed by former head brewer Adrian McNulty when it looked like the brewery might close in 2012. Around 300 litres has been sat in a tank since then, much of which has gone into the Old Brown. The beer is more than just a blend of two old beers, however. Indeed, it's probably easiest just to pass on what Brendan told us: "Produced using various fermentation and maturation techniques including kettle souring, abbreviated fermentation, maturation in old wine barrels with lactic acid bacteria and wild yeast" – and then the blending of old and young. It's also a homage to the 3 Ravens mythology that brewery founder Ben Pattinson concocted almost 15 years ago, essentially a story in which Norse god Odin sent his two ravens off to discover the meaning of life so he could turn it into a potion. Loki sent his prankster raven Jack along to spy on and troll them and, long story short, Loki ended up joining Odin's gang, introducing the elements of creativity and imagination – "sort of like a third eye" – to reflect the brewery's original story of an engineering company venturing into beer. As for the Old Brown, it's another fine Victorian entry into the world of Oud Bruin and Flanders Red style beers this year. There's hints of acetic acid atop the toffee apple sweetness, wine like cherry fruits and a cleansing lactic acidity that makes it drink easier than its 7.3 percent ABV. Look out for the next two Wild Ravens coming later in the year and early in 2017.